The Democrat Party likes to pose as the party of compassion. But where is the compassion in "sanctuary cities" that allow foreign criminals to prey on innocent Americans? Where is the compassion in encouraging envy and lawlessness? Crystal Wright isn't falling for the liberal con job any longer. A one-time (2008) Obama supporter herself—and now a totally fearless "Conservative Black Chick"—Wright blows the whistle on the Democrat Party and its policies that are destroying America. 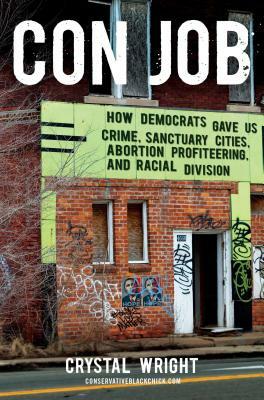 In Con Job you'll learn why Democrat politicians have no problem with inner-city riots; why Democrats so fervently defend Planned Parenthood, how Democrats are remaking America through massive immigration and more. The 2016 presidential election is set to be one of the most consequential in American history—and Crystal Wright's book is the one you need to help friends and family avoid falling for the Democrat con job yet again. Crystal Wright is the editor of the blog Conservative Black Chick and the principal owner of Baker Wright Group, a full service public relations firm. She contributes political commentary regularly to several major news channels, including CNN, HLN, Fox News Channel, Fox Business Channel, and Wilkow Majority on SirusXM. In 2014, Wright became a regular guest co-host for WMAL's Washington Mornings and the host of WMAL's Saturday show. Wright has appeared on several national television and radio shows, including PBS' To the Contrary, Bill Bennett's Morning in America, the Geraldo Rivera Radio Show, The Sean Hannity Show, Washington Watch with Roland Martin, BET's Weekly with Ed Gordon, WVON's The Cliff Kelly Show, The New School hosted by Charles Ellison on Sirius/XM Satellite Radio. She has written for The Washington Post, The New York Times, Loop 21, Politic365, AP, and The Washington Informer. Wright was honored to speak at the Conservative Political Action Conference's 2014 meeting in a featured panel Why Conservatism is Right for Women. She also spoke in 2013 at CPAC's 40th anniversary in a featured panel The Right View and the REAL Issues with four other distinguished conservative women. In 2012, she was honored to speak about the rise of GOP women in politics to a group of Minnesota Republicans and joined other Republican women at CPAC Colorado in a panel discussion about the False War on Women. Wright earned a Bachelor of Arts in English from Georgetown University and holds a Masters of Fine Arts in Theatre from Virginia Commonwealth University.